Registration Opening Date: The BITS HD 2019 Application Form is available for candidates from 18th March 2019 onwards. Last Date: Candidates have the time till 30th April 2019 to fill, pay the registration fee and submit the application form. Details Required: Candidates are required to fill the details regarding degree, test centre preference and personal information (Nationality, phone number, city, state etc). Documents Required: The scanned copy of candidate's recent photograph and signature. If a candidate is seeking admission through GATE/GPAT route, then it is mandatory for them to upload a self-attested scanned copy of their GATE/GPAT scorecard. Registration Fees Details: The last step in the application process is to pay the registration fee. It should be noted that the fee once paid will not be refunded. Payment mode: Both Online and offline methods are available for the candidates to pay the application fee. The offline fee payment can be done by cash by downloading pay- in- slip. Claims For Reservation: It should be kept in mind that there will not be any change in the claim for reservation after the submission of the Application Form. 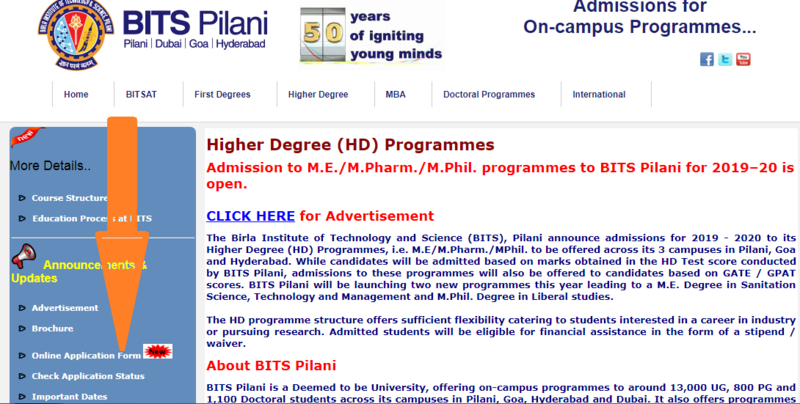 Candidates need to send the hard copy of the Application form to the admission office of BITS Pilani via speed/registered post. Also, candidates should keep a copy with them for further reference. Step 2: Filling the Application Form. Step 4: Pay Application Fee. Step 5: Print and Send filled form by Post. This link will take candidates to an instruction page, as shown below. After carefully reading the instructions, candidates have to follow the "Allow me to Apply Online" link given at the bottom. This will take candidates to the step-wise guide page, where candidates have to choose the "New Registration" to proceed to the application form. Upon following the "New Registration" link, candidates will be taken to the "Personal Details" page. Candidates need to enter the mandatory personal details about them, like Full Name, Gender, Date of Birth, email address. Then candidates have to choose one admission path they want to choose out of three given options, before entering the Captcha and clicking "Proceed". Click the "Proceed" button to complete the registration. Now, candidates will have to enter the detailed personal and academic details, as shown below. Candidates should enter valid and true details that match their academic records. If any discrepancies are found candidates will be disqualified. Candidates should upload scanned copies of their Photograph and Signature, whose sizes should be between 10 KB to 30 KB and 2 KB to 20 KB respectively. Candidates need to make sure that the images are in .JPG/.JPEG format. If candidates are seeking admission through GPAT/GATE Score then, they have to upload the scanned copy of their GATE/GPAT Score in JPEG/JPG format too. Candidates will be directed to the payment page after successfully uploading the scanned documents. The candidates can make payment through both online and offline mode. For online mode, payment can be done by using Credit Card/Debit Card or through Net Banking. Candidates can also pay offline by downloading and printing pay-in-slip, and paying cash along with it at any ICICI bank branch. One of the copies of the slip will be retained by the bank, and the candidates can have a copy. The other copy has to be sent along with the application form to the college. Candidates should take a print out of the filled application form after paying the fees. One copy of this form must be retained for future reference. The other copy, after self-attest, has to be sent to the address mentioned, along with a copy of the pay-in-slip. Postal Adress: Admissions Office, Birla Institute of Technology and Science (BITS), Vidya Vihar, Pilani, Pincode - 333 031, Rajasthan, India. In case candidates face any technical difficulty while filling the form, they can call to 01596-242205 (Pilani Campus), 0832-2580126 (Goa Campus), 040-66303830 (Hyderabad Campus) between 10.00 AM till 5.00 PM on all working days. What is the application fee amount for the BITS HD exam? The BITS HD exam application fee is Rs. 2090.